 This tedious first novel offers yet another variation on the Diary of a Mad Housewife theme. Roberta and Andrew's only son, Gary, has been killed in Vietnam. Roberta signed papers so he could enlist at 17; Andrew works as an accountant at the Pentagon. Roberta goes to Arlington Cemetery every day; Andrew refuses to join her. Desperate for consolation, or at least unfamiliar surroundings, Roberta gathers up all the Trip-Tiks she can, gets into her car, and takes off. She picks up a hitchhiker (a draft-dodger and protester) to whom she can relate like a mother. When he grabs her purse and runs off, readers suspect his resemblance to Gary might be stronger than Roberta admits. She might think she shared a special bond with her son, but it's obviously not borne out by tales of his drug use or hints at his frequent lies. 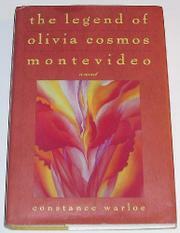 Upon entering New Mexico in a car about to break down, she spots a fortuitous road sign giving the mileage to three small towns: Olivia, Cosmos, and Montevideo. ``It reads like a name. My own name wilts by comparison.'' On impulse she assumes this new, ``exotic, dangerous'' name which, she realizes later, is ``a euphemistic way of saying `oblivion.' '' It puts her in perfect sync with the New Agers and Do-Gooders she meets in Santa Fe. And this is still less than halfway through this long-winded first-person narrative. If Roberta seems interestingly troubled and a bit quirky in the early pages, by the time she arrives in New Mexico she's simple-minded and egotistical. Warloe attempts to break out of Roberta/Olivia's whining monologue by interweaving several narratives: the present, memories of her life with her husband, memories of her son in various time frames, imaginary conversations she would have had with Gary if he'd returned from Vietnam. A more seasoned writer might have succeeded.